Being a Travel Blogger: What Is It Really Like? Home » Blogging » Being a Travel Blogger: What Is It Really Like? Being a travel blogger is a demanding yet rewarding experience. However, it’s also deeply personal. This means that you are the only person who can to say whether becoming a travel blogger is worth it. Consider the realities of this life and study personal perceptions of some experienced bloggers. Then answer, does that kind of life call for you? Do you want to take that risk? Is the joy you are sure to experience worth some discomforts? If it’s a ‘yes’ for any of those questions, you should give it a try and create a travel blog. You can find plenty of articles about the ‘non-glamorous’ and ‘ugly’ sides of being a travel blogger completed with quotes. They are available on Daily Mail, Huffington Post, Travel + Leisure, and dozens other sources. All of them are definitely true. There is an ugly side to travel blogging. It’s also nowhere near glamorous. However, the truth is that despite all those facts, the number of people who start travel blog sites grows. Even the bloggers who are quoted in those articles that seem to exude negativity persist in this job. Many of them outright come out and say that they ‘wouldn’t trade it for the world’. And that’s because being a travel blogger is amazing. It’s hard work and there are bad times, but the sum total is that the positive outweighs the negative. Any job can be hard, no matter how much you love it. If you plan on starting a travel blog yourself, you need to understand that this is a job. It’s not a paid and laidback vacation you need to scribble a few lines about in your personal journal. However, once you get over that misconception, you can enjoy blogging about travels and make money from it. If you create a travel blog to support yourself from the money it makes immediately, you’re out of luck. It will take some time (usually a lot) for your blog to pick up as your audience grows. And you have to be prepared for the outcome that it might never pick up as much as you want it to. As you can see, the majority of those income sources are tied to advertisements. This means you need to have a large readership base and high popularity rating to get those deals. Being a travel blogger is more about clever promotion of a personal brand than actual writing about traveling. And before you get to the point when your brand is strong enough to be attractive to advertisers, you won’t be getting much money. The solution is to either have a capital before you change your life and start a travel blog or find additional income sources. It’s a sound idea to start building and promoting your blog while busy with a different occupation. For example, you can travel and help people. This will instantly give your blog some popularity boost. The world today pays attention to social and economic issues that plague its remote corners. You might be surprised to learn that travel bloggers put in more hours into their work than the majority of people working in any other industry. They have no choice because their own industry is extremely competitive. This means that when you create a travel website, you have to push yourself to be better with every post. When a travel blogger isn’t outside taking shots, traveling, or interviewing someone for more exciting content, they are glued to a computer screen. The content needs to be edited, published, and promoted. You also need to keep up with your correspondence and keep an eye on regular and frequent social media updates. Don’t forget the part where you actually have to write posts, SEO optimize them, and create digital products to sell. You also need to research destinations, find facts about them to excite your readers with, create itineraries, and book flights. 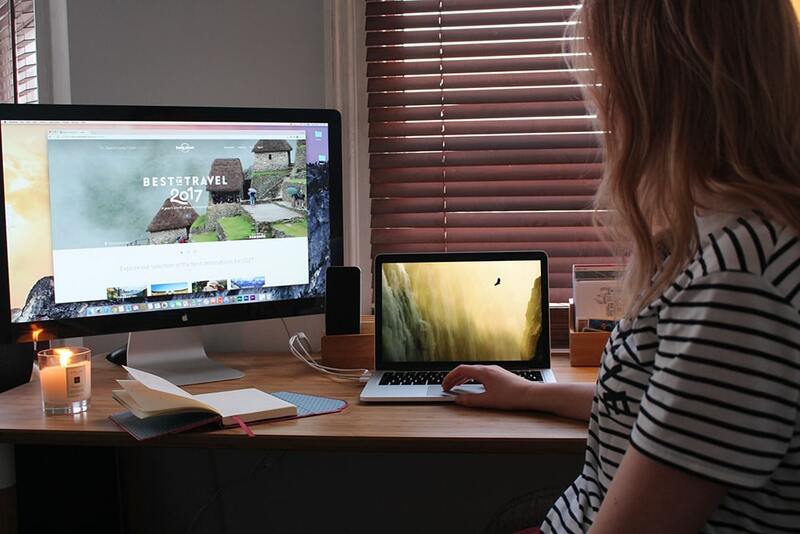 ‘Hectic’ is too weak a word to describe what’s it like being a travel blogger professionally. And don’t forget that a blog needs to be updated and maintained all year round. There won’t be long vacations in your future. On the other hand, to be a travel blogger is to learn and improve constantly. Yes, you are busy, but you are doing exciting and valuable stuff. You can use technology to help you and build a team to delegate some tasks. This is a full-time job that will never become dull. You can also do it while lying on a sandy beach and drinking sweet juicy cocktails. Some less favorable articles say something along the lines of ‘being a travel blogger is being homeless’. In a way, it might be true because the need to be on the road constantly prevents you from putting down roots anywhere. On the other hand, you are free to explore any location on this planet. The world is a magnificent place and discovering all its beauties can take many years. Becoming a travel blogger can give you this opportunity. So, What’s Becoming a Travel Blogger Is Like? Answering this question is like answering ‘what is it like to travel the world?’ It’s good most times, it’s hard sometimes, and it’s different for everyone. It’s true that there are some very good reasons to go on a trip around the world. However, becoming a travel blogger will make that a working trip. Is this OK for you?